Years ago I took hundreds of live snails from the tidal flats of Florida – just for their shell homes. With the passage of time, wisdom came of what Id done – along with regret which gave way to forgiveness, and from this fertile matrix these Guiltless Shells appeared, as if by magic. We live in a world shaped by addiction. The Drug manifesting itself in a multitude of forms – none of us able to escape Its net. Today in the newspaper I read of a “ghost net” found in the ocean – 500 yards of mesh – so heavy with dead sea life the Coast Guard was unable to retrieve it. Evidence of one addiction – greed. I was once a shell collector who found and killed the life form that had made the shell I wanted; shell collecting was my addiction. I quit cold turkey in October 1987, never to collect again as I’d done in the past. But the desire to collect shells was and still is there. This desire became the fuel that burned within me, that with time led to these “Guiltless Shells”. In 1976 I bought my first box of white polymer clay; an oil-based clay that I could fire right in my own kitchen. It was easy for me to see the potential of this clay for a crafter like myself. But making seashells of this clay never occurred to me. I can still remember where I was when I formed my first yet unnamed shell of clay. It was a cold winter day, just like today, sitting in front of a wood fire, with clay in hand, trying again to make a white spiraled shell. And then it happened: I made my first crude shell. For the next few years I practiced making the whorls of the gastropod form, not focused on color. I was much like a composer who had finally been able in melody to express his beloved object, knowing that words, like color, would come later. Spending years fine tuning the melody, aware that the very form, melody, couldn’t truly blossom until it was joined to the yet unknown lyrics. I must admit I was getting frustrated. All my attempts to capture my color lyrics to complete my shells failed. Mechanically I colored my shells with acrylic paint, or rubbed the white clay over colored newspaper ads to add tint cheaply. Rolling the clay back and forth to make as perfect an elongated cone as possible to form the spiraled whorls. But one day the magic happened! It was as if my hand took over and had a mind of it’s own, and rolled the clay in one direction, over and over again – not back and forth. My eyes looked down, and consciously I finally caught on. 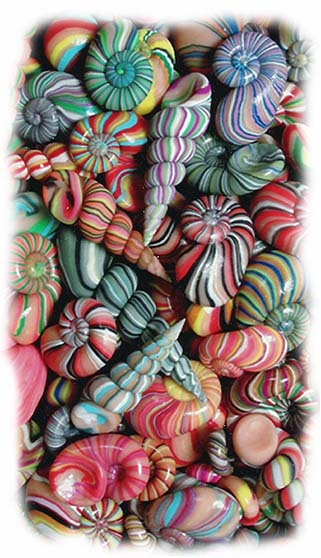 Here was how to express the essence of coloration of natural seashells. The rest is history. If you’d like to create your own Guiltless Shells click here for starter kits. Posted by Annie Olson on September 26, 2008.